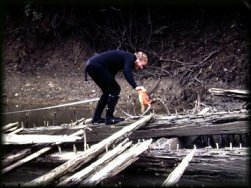 In an effort to further our understanding of numerous wooden barge remains found throughout state waters, the Underwater Archaeology Branch invited archaeologists and historians from North and South Carolina to a workshop held on March 22, 1989 at the North Carolina Maritime Museum (NCMM). The purpose was to determine the body of knowledge that existing for this class of archaeological resource and to discuss how they can best be managed by state regulators. The focus was on the Arnold Flat, a log chine flat that had recently been recovered from the Trent River and was undergoing conservation at NCMM.